See you in Myanmar as Games end! 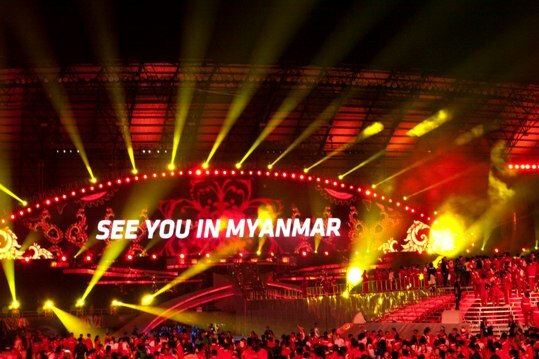 Home > Location > Southeast Asia > Myanmar > See you in Myanmar as Games end! Another extravagant showpiece was laid on by organizers of the 26th Southeast Asian (SEA) Games with closing Ceremony at Gelora Sriwijaya Stadium in Palembang South Sumatra. Vice President Boediono said the true winners of the Games were all those participating at the event. He also expressed his condolences to the families of two supporters who died at the soccer final between the host team and Malaysia. "In the SEA Games, we have showcased our achievements to the Works," Boediono said in his speech.
" however, in the midst of our joyous festivities, two supporters died. On behalf of the government and my personal self, I express my deepest condolences." Two Indonesian soccer fans died during the final match between Indonesia and Malaysia on Monday at the Gelora Bung Karno Stadium in Jakarta where Malaysia Successfully defended its Games title through a penalty shootout. The two supporters were found dead apparently trampled by a mob fighting to get into the stadium through a broken gate. 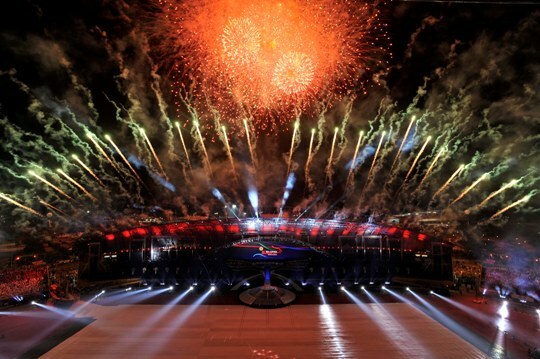 The Rp 125 billion (US$13.8 million) ceremony opened with a burst of fireworks followed by 600 dancers performing the Bersatu untuk Maju (United for progress) dance by Indonesian choreographer Sentot Sugiharto. Later, hundreds of athletes representing all participating nations entered the stadium to greet and wave to the scores of spectators, including Boediono and his wife Herawati Boediono. The Ceremony also showcased Myanmar dancing as an introduction to the next Games host before the fiesta officially ended with another set of fireworks. During the ceremony, Indonesia Southeast Asian Games Organising Committee (INASOC) chairperson Rita Subowo thanked all delegates, the media, and public for their support in helping the organizers and lauded Indonesia's athletes for making the host country overall Champions.
" Congratulations to all Indonesian Athletes, we are the overall champions. You proved that we can do it" Rita said. She handed over the SEA Games Federation flag to a representative of Myanmar as a gesture of the continuance of the hosting work for the next Games in 2013. Outside the sports complex where the stadium was located, thousands of people gathered to watch the closing Ceremony, but those without tickets were prevented from entering the complex by security. Even so, the crowd enjoyed the fireworks as the closing ceremony officially ended. I just hope after hosting the SEA Games, Palembang will be respected by other region. The SEA games went very well." A Palembang resident Muhtadin stated. A simulation of the Closing Ceremony was also held in Jakarta presided over by the Jakarta Governor at the munask Jarkata.